The Northwestern Mutual - The Waggoner Financial Group is a financial firm of Northwestern Mutual focused on financial education and dynamic planning. We provide the Greater Lansing Area with a variety of world-class financial products, services, and expertise. In addition, our Financial Representatives are residents who understand and share the values and ideals of the communities they serve. They know the local environment in which companies operate and what it takes to succeed. As a District Office, we have a multitude of support systems to conduit Network advisors and specialists nationwide, broadening the insight they use to help you prepare for your future. As Managing Director, Eric Waggoner leads the East Lansing District office in guiding individuals, families, and businesses to secure a financial future. We take pride in the advanced level of professionalism and sophistication our clients receive when they work with our team. Our sincere empathy and genuine honesty ensures our clients that we have their best interests at heart. At Northwestern Mutual, the process involves risk management, wealth accumulation and wealth preservation and distribution. Risk management helps to ensure clients are prepared to weather life’s storms. Wealth accumulation is structured to make the most of client’s money and help them achieve their future. This leads into wealth preservation, which is designed to deliver financial security and guide the transition of wealth into predictable income in retirement and legacy planning. What's our office culture like? Take a look. Northwestern Mutual - The Waggoner Financial Group honors its mission by operations according to a set of core values: Professionalism, Leadership, Attitude, Collaboration, and Exceptionalism. We are a values-driven, inclusive culture that demands exceptional performance and celebrates successes. As part of Northwestern Mutual, our independent financial representatives are highly trained professionals who have exclusive access to a wide range of quality products and services, including life insurance, disability income insurance, education-funding alternatives, retirement planning and income distribution solutions, estate and business planning. Representatives work locally, but have all the resources of Northwestern Mutual behind them to help their clients achieve their goal of financial security. We have a passion for helping each other and our community. We believe that an investment in our community, is an investment in our future. Alex's Lemonade Stand Foundation for Childhood Cancer Research is Northwestern Mutual's corporate philanthropic partner, our Network Office is a proud supporter of its efforts. Making a difference in our community is an important component for us and Northwestern Mutual. What's our Quarterly Involvement? Click here to find out! 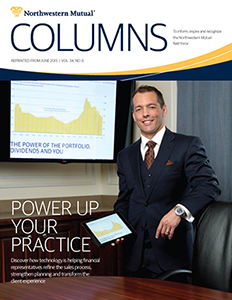 As an early adopter of technology, our Managing Director, Eric Waggoner was featured in a recent issue of Northwestern Mutual's Columns magazine, promoting the use of technology and how it streamlines workflow while enhancing the client experience. In addition to this issue of Columns, Eric and his team were invited to speak at this year’s annual meeting in Milwaukee, Wisconsin, on several topics ranging from integrating workflow applications to helping families prepare for a comfortable retirement. Northwestern Mutual is the marketing name for The Northwestern Mutual Life Insurance Company, Milwaukee, WI (NM) (life and disability insurance, annuities, and life insurance with long-term care benefits) and its subsidiaries. Eric B Waggoner is a Representative of Northwestern Mutual Wealth Management Company® (NMWMC), Milwaukee, WI (fiduciary and fee-based financial planning services), a subsidiary of NM, and federal savings bank. Representative is a District Agent of NM and Northwestern Long Term Care Insurance Company, Milwaukee, WI, (long-term care insurance) a subsidiary of NM and a Registered Representative of Northwestern Mutual Investment Services, LLC (NMIS) (securities), a subsidiary of NM, broker-dealer, registered investment adviser and member FINRA (www.finra.org) and SIPC (www.sipc.org). Eric B Waggoner, District Agent, the Waggoner Financial Group has Financial Representatives that are primarily licensed in Michigan.